Everyone likes to go on vacation when they can. 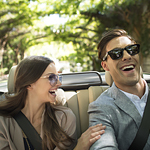 There are several things you can do to help make your trip go smoothly. The first thing you should do is plan out your trip and know the route. You don't want to be stuck in the middle of nowhere without cellphone service and miss your turn. Another thing you should do is be prepared for the worst. You should have a toolkit in your vehicle so you can work on your car in case of a breakdown. You should also have a full-sized spare if you can fit one in your car. Another key tool to have in your vehicle is a flashlight; this will allow you to make repairs regardless of the light level. One last thing you should do before you go on vacation is taking your car in to get serviced. This will reduce the chances of your car breaking down and preventative maintenance could save you time and money on your trip. Visit us at Volvo Cars of Dayton to have your maintenance done before your trip.